Like a historic seal of approval to Jews' claims to their Land, a stamp with Menorah is found in Akko. Dr. Danny Syon, courtesy of the Israel Antiquities Authority. Just two weeks after a Temple era seal was displayed to the public, archeologists continue to dig up breathtaking proofs of the ancient and never-severed connection between Jews and the Land of Israel. This time, the find is a 1,500 year old tiny stamp discovered near the city of Akko, bearing the image of the seven-branched Temple Menorah. The stamp was used to identify baked products and probably belonged to a bakery that supplied kosher bread to the Jews of Akko in the Byzantine period. 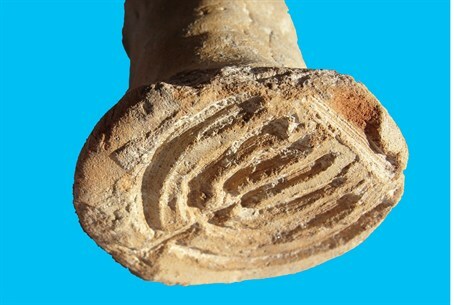 The ceramic stamp dates from the Byzantine period (6th century CE) and was uncovered in excavations the Israel Antiquities Authority is currently conducting at Horbat Uza east of Akko, prior to the construction of the Akko-Karmiel railroad track by the Israel National Roads Company. According to Gilad Jaffe and Dr. Danny Syon, the directors of the excavation on behalf of the Israel Antiquities Authority, “A number of stamps bearing an image of a menorah are known from different collections. The Temple Menorah, being a Jewish symbol par excellence, indicates the stamps belonged to Jews, unlike Christian bread stamps with the cross pattern which were much more common in the Byzantine period." There were no Muslims in the region at the time -- because the Quran had not yet been written. According to Syon, “This is the first time such a stamp is discovered in a controlled archaeological excavation, thus making it possible to determine its provenance and date of manufacture. The stamp is important because it proves that a Jewish community existed in the settlement of Uza in the Christian-Byzantine period. The presence of a Jewish settlement so close to Akko – a region that was definitely Christian at this time – constitutes an innovation in archaeological research." "Due to the geographical proximity of Horbat Uza to Akko, we can speculate that the settlement supplied kosher baked goods to the Jews of Akko in the Byzantine period," the excavators added. The stamp is engraved with a seven-branched menorah atop a narrow base, and the top of the branches forms a horizontal line. A number of Greek letters are engraved around a circle and dot on the end of the handle. Dr. Leah Di Segni, of the Hebrew University of Jerusalem suggested they probably spell out the name Launtius, which was common among Jews of the period and also appears on another Jewish bread stamp of unknown provenance. According to Dr. Syon and Gilad Jaffe, “This is probably the name of the baker from Horbat Uza." Horbat Uza is a small rural settlement where clues were previously found that allude to it being a Jewish settlement. These include a clay coffin, a Shabbat lamp and jars with menorah patterns painted on them. Click here to download high resolution photographs.